From Terry Gough, Dec 2006. A few short thoughts from around 1944/45. During the school holidays there was the freedom to roam, over hills and meadows and in deep woodland glades. Days to fantasise and play, when time was of little consequence, and meals were dictated by the seasonal contents of mother nature’s table. Coombe Hill was climbed, from Coombe Road. Dizzy heights then for our tender years. Shirts billowed concealing rosy red apples, and pockets bulged with filbert and hazelnuts taken from the orchard and hedgerows below Coombe Hill. Our lips and chins stained with the juice from blackberries that we picked from an abundance of bushes on our way. From the top of Coombe Hill we were in awe of the scenic beauty that is the Coombe valley. Sheep and cattle grazed unperturbed in the lush green fields, below the tree-lined slopes of the hills. Crows ‘cawed’ and floated on the warm winds that rose and fell in the valley. Gaston’s Brook silently meandered lazily along the floor of the valley, the bright sunlight glistening on the ripples of its slow moving current. Cotswold Gardens could be seen from the hill. 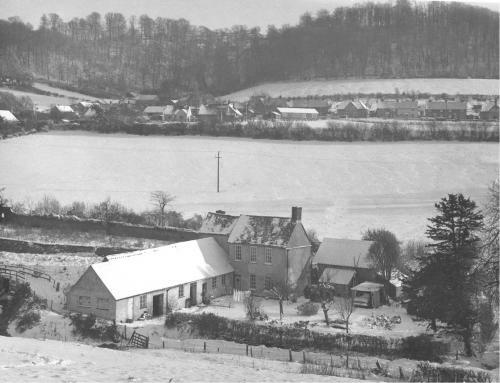 The white walled houses on the estate were in marked contrast to the red bricked houses on the Raglan estate, and the grey dry stone walls that divided many of the fields around the estates. We shouted, jumped up and down excitedly in our childish belief that Mum would be able to see and hear us. All that we heard was the echo of our screams and shouts as they reverberated around the valley. Other days would find us on Synwell playing field. We could be found playing on the swings or the slide that was provided for our leisure time. Or if we tired of that we wandered off to the bottom of the field to play among the mounds of soil that had been deposited there. This soil had been excavated from the new building site at the top of Synwell Lane. On completion (at around 1948/9) the estate was to become known as ‘Mount Pleasant’. The broad outline of the estate was one tarmac road from the top of Synwell Lane through to Wortley road. On either side of the road are mostly three bedroom-terraced houses, facing each other across the road. The exterior walls of these houses were finished in a sandstone colour. Nan’s sister (Vi) and her husband Edgar occupied one of these council owned houses. Vi and Edgar Bailey (auntie Vi and Uncle Edgar, had three children, Primrose (Prim) was the eldest daughter – who later married Harold Smith. Jill was the second daughter, who I believe to have been Nan’s favourite. Then there was Robin, the youngest. I never really got to know Prim, Jill or Robin. Although, our paths do seem to cross from time to time. Auntie Vi and Nan were very much alike, in looks and build. In fact they were very often mistaken for twins. Both had quite broad Gloucestershire accents. On some occasions, when Nan and Auntie Vi were talking, I had to ask Nan to explain to me what they had been talking about. We played for hours among the mounds of soil, with our buckets and spades, saved from earlier visits to Weston-super-Mare. With our ‘Dinky’ toys (cars and lorries) brought from home we set about building roads over and around the mounds. On these roads we raced our cars up and down to see how far they would go with one push. Finally, as darkness approached Mum or Dad would come looking for us to take our toys, and us home, for a good wash and brush up. This was done in the tin bath, in front of the fire in the range. The following day we returned to find that older children riding their bicycles over the mounds had stamped on what we had lovingly created had ruined our work. The whole of Cotswold Gardens and Ragnall echoed to the sounds of children playing, screaming, shouting, but most of all enjoying themselves. We didn’t go around damaging other people’s property or attacking old people, just because we were bored. We were too busy making our own fun to be bored. On the way home we stopped to pick bluebells and primroses that grew in abundance among the trees in the woods. Near the lower reaches of the woodland the bluebells danced to the winds tune, on a carpet of blue and green. The primroses nestled gently on the woodland banks, as if watching the bluebells’ performance. Their small orange eyes swaying back and forth on the cool woodland breeze. Even the breeze, high in the trees, sounded like an appreciative applause. On some warm and sultry evenings, on the playing field, fights would break out between some of the older boys. These fights would usually be over something quite trivial. It was often the case that one boy had used another’s bike or scooter without permission, or pushed another off the swings. As these fights started (sometimes they were bare fistfights or as often as not sticks were used to hit each other with) dozens of us would suddenly appear, as if from nowhere, to form a ring around the two combatants. As each blow landed, we all cheered, booed or hissed not caring who would win or lose. As if out of nowhere the parents of the two fighters appeared, to break up the fight and severely reprimand their respective sons. Then the circle of spectators would disperse as quickly as it had formed. Leaving just the trampled grass and discarded sticks used in the fight. Minutes later the playing field was back to the normal bustle of children’s play area. During the cricket season, when the Wotton Eleven played at home on the Playing Field, Nan was one of the volunteers who helped prepare the tea and sandwiches for the players in the Pavilion. On these occasions I liked to go into the pavilion and sit with Nan while she and the other ladies prepared the teas. I would be given sandwiches and tea or lemonade while I sat quietly at a table. However, some time later Dad got to hear where I had been, and banned me from going in there again. When I asked Dad why I couldn’t go to see Nan at the pavilion again, I was given a sharp rebuke and told it was because he said so! “Why, Dad?” I asked. “Because I said so, and that’s an end to it!” Dad said angrily. “Besides, if you keep hanging around her, letting her molly coddle you you’ll never be able to stand on your own to feet.” He concluded. How can you say that Dad, I thought (as I grew older) if you and Mum had not spent so much time rowing and fighting and spent more time on love for your children, then I wouldn’t need to run to Nan for love and comfort whenever I felt upset. In spite of his warnings I still visited Nan whenever she was up at the pavilion, suffering with a ringing ear on the odd occasions that he found out, but it didn’t stop me.